Hiya everyone! Hope you have all had a lovely weekend. Yesterday I had my gorgeous twin cousins over which was so lovely. They are only 2 years old. Oh how I wish I was that age again. Just living carefree with no worries or anything. Such a lovely age to be. 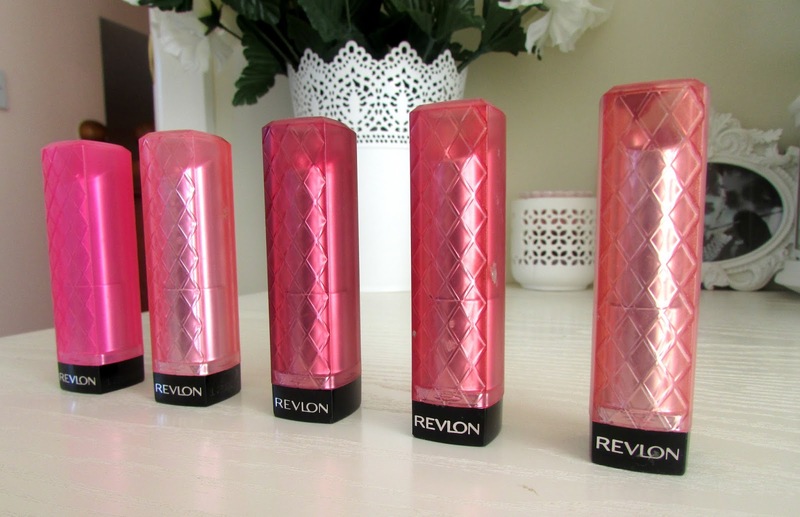 Today I thought I would do my first ever haul on my blog which is from Avon. Now I don't know about all you other beauty bloggers out there but Avon seems to be such an underrated brand to me. I barely ever see products on blogs for them and if I do it's just a lipstick here or there, but to me its one of my all time favorite beauty brands. 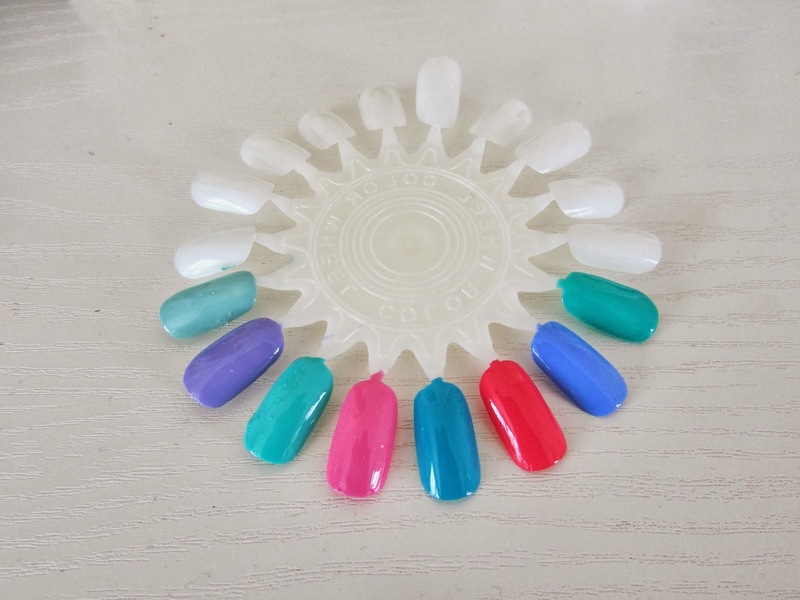 The products are super affordable, last such a long time and they are such good quality and actually do work. I will admit that I have had some products that do not work but at least I know I haven't spent a fortune on it. The first product I bought is the cinnamon and cranberry shower gel. I thought that this would be a perfect shower gel for the autumn months as it smells incredible and these are two of my favorite ingredients as well. The bottle is an incredible size (400ML) and will be lasting me a very long time. I've used this twice already and other than the smell it lathers up really well and leaves your skin smelling gorgeous and leaves it really soft too. I then chose to purchase two body lotions as well. 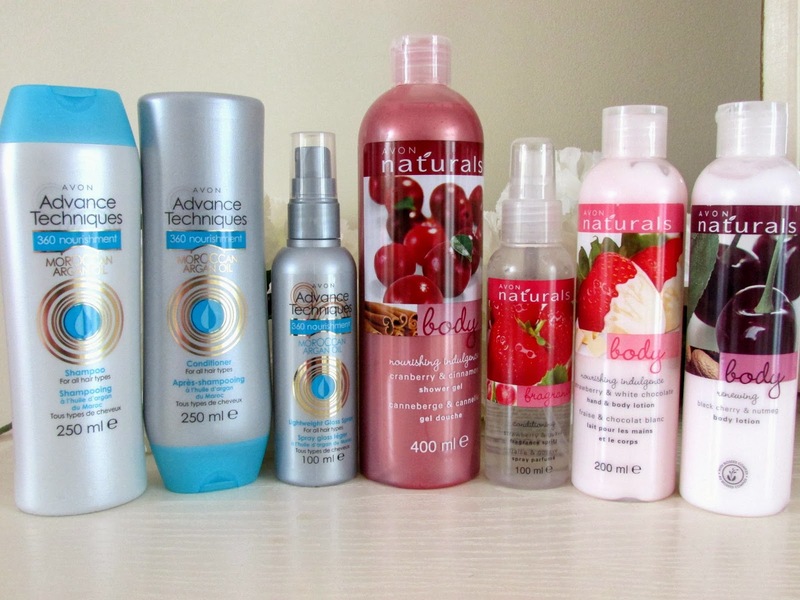 The first one is Strawberry and White Chocolate and as well as being a body lotion is also a hand lotion. The main reason I got it was for the ingredients. I was expecting it to smell incredible and I have not been left disappointed. The second lotion is a black cherry body lotion. Now I actually didn't order this initially. I had ordered a body lotion to match the shower gel but they unfortunately ran out and sent me this instead and I'm glad they did as the scent is incredible and just screams winter. I haven't yet had a chance to use these as my mum has pinched both of them but once I do I will try to review them if you are interested. The next three items were a set. I have struggled to find a good shampoo and conditioner for my hair as it gets greasy super fast and often feels very dry. A few months ago I spotted my mum using this and decided to use it and my hair was instantly revived. It leaves my hair refreshed, gets rid of all dandruff and it leaves a really glossy sheen to my hair too so I wasn't going to miss the opportunity to purchase this once the catalog came through my door. I also purchased a light gloss spray just to add a bit more shine to my hair too. Once again once I've had more use out of this product I will review it. 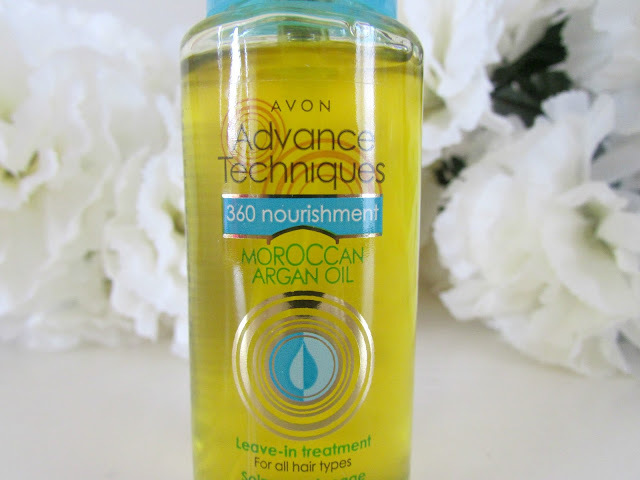 I recently reviewed the Moroccan Oil from Avon which you can find HERE if you are interested. The last item I bought is actually neither skin care or beauty related but I thought I'd include it instead. 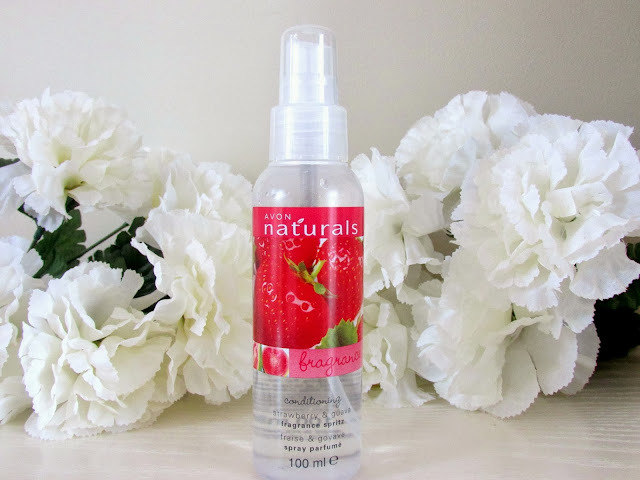 I decided to purchase a Strawberry and Guava fragrance mist for my room. My main reason for this purchase was because whenever I cook or my parents cook the smells from the food tend to travel up there and I don't like the smell it leaves. So now I have a simple solution to this problem. It smells absolutely incredible too. So those are all my recent Avon purchases. I am so excited to use these products especially on pamper evenings as I believe those are the best times to start using them. 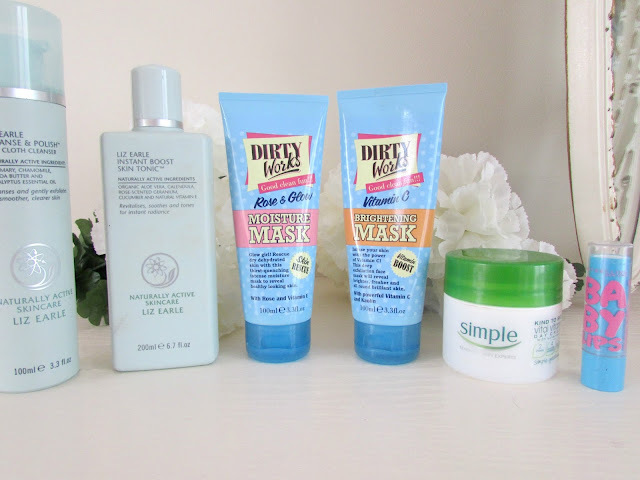 If you'd like reviews of any of these products leave me a comment below. Do you like the brand Avon? 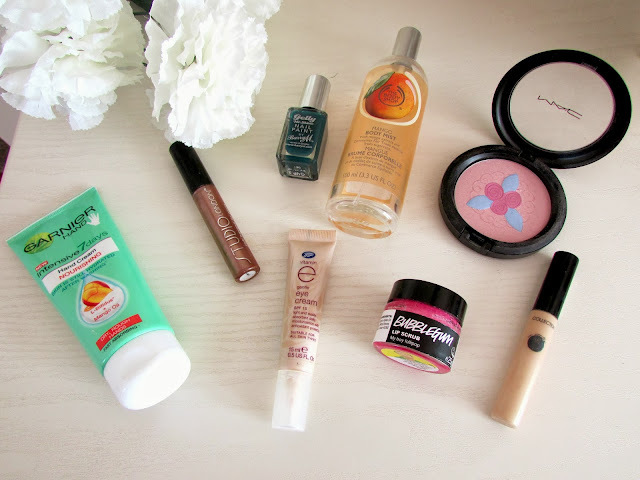 If you use them what are your favorite products? Leave me a comment below. Hello there girls! I hope you all had a fabulous weekend! I can't believe it's Monday already. Universities have just started to go back including my one. It's hard to believe that this time 3 years ago I was settling in to my uni room and beginning my university career. I cannot believe how fast the past three years has gone. If you have just started university please do make the most of freshers week and your first year. I was so shy in my first couple of weeks that I didn't really have the best of times. Biggest regret ever. If you would like me to do a university guide type post for you then please leave me a comment below. 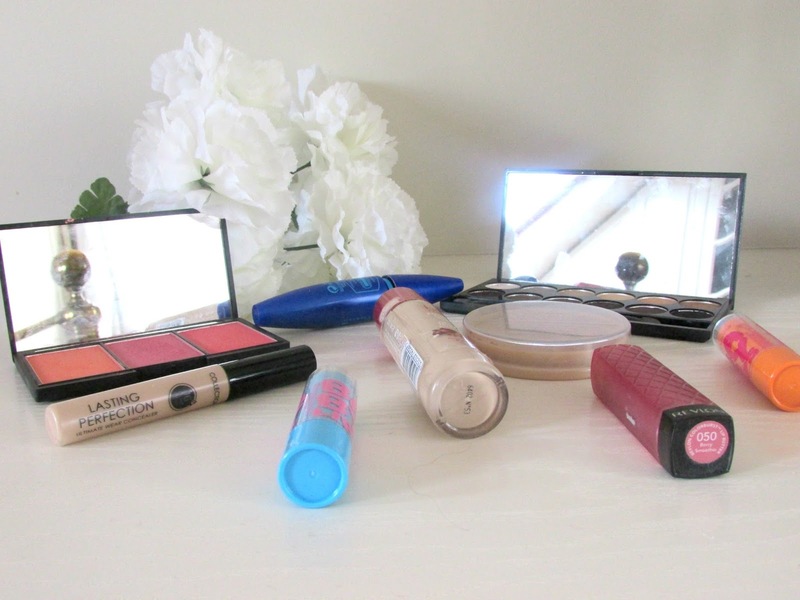 Now before I carry on rambling today I thought I would do a post regarding my everyday make up. Now make up is only something I have gotten into the past couple of years. I was never one to go out with a full face of make up. Sometimes I would borrow my mum's powder to get rid of shine and apply lip-gloss and that would be me done. Apparently I was a lot more confident in my skin back then than I am now. But I have gotten into more make up recently and begun experimenting so let's get into what I wear on an every day basis. Most of these products I have done an in-depth review of so links will be provided beside the products once I have mentioned them. Now before I start to apply any make up on my face I use my Simple Moisturizer to provide a nice base to apply my foundation (REVIEW HERE). One this is applied I apply my favorite foundation that is the Bourjois Health Mix Serum in Shade 53 (REVIEW HERE). I apply this all over my face with the real techniques buffing brush. After this I go in with my Collection Lasting Perfection Concealer. I use this under my eyes and on blemishes because I find it just covers them absolutely amazingly and it also gets rid of those nasty dark circles underneath my eyes. Now I'm not the biggest fan of eye make up. All I tend to wear is just one eye-shadow and a bit of mascara then I'm good to go. Before the eye-shadow is applied I take a little bit of foundation and just place that on the eyes in order to make sure the color stays put all day. The eye-shadow I wear is from Sleek's Au Natural Palette. I choose the shade 'Conker' as it is a gorgeous dark shimmery brown color that suits my skin tone perfectly so I just sweet this all over my lid for an every day look. I don't tend to go in with different colors on my lids unless I am going on a night out or special occasions. Once this is done I will apply my absolute favorite mascara which is the Maybelline Rocket Volume Express Waterproof mascara. I just apply this to my top and bottom eyelashes and that is my eyes done. I need to invest in good primers for both my face and my eyelids so if you have any recommendations let me know below. So once I have done my eye make up I then go back to my face and apply a little bit of blusher. I use the Sleek Palette in Lace (REVIEW HERE) and just apply this onto my face with a blush brush. I use the middle shade in the palette which is called Guipure that is a gorgeous shimmery orange color. After this the final stage is of course the powder. I use the Rimmel Stay Matte Pressed Powder in the shade 'Silky Beige' (REVIEW HERE) apply that all over my face using a kabuki brush. I focus more on my t-zone when I am applying this particularly near my nose as this is where I produce the most shine which I actually find annoying. But anyway, after the powder that is my face complete. 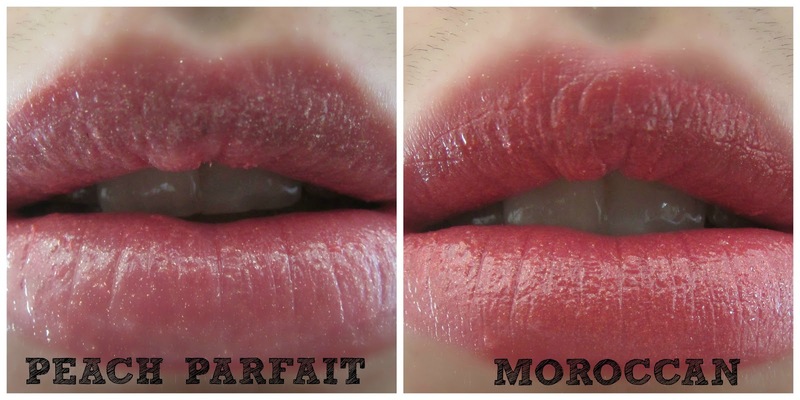 Doing my lips is probably my favorite part of my whole make up routine. Is that weird? Probably but I don't know why I just feel like everything comes together once your lips have some color or shine on them. 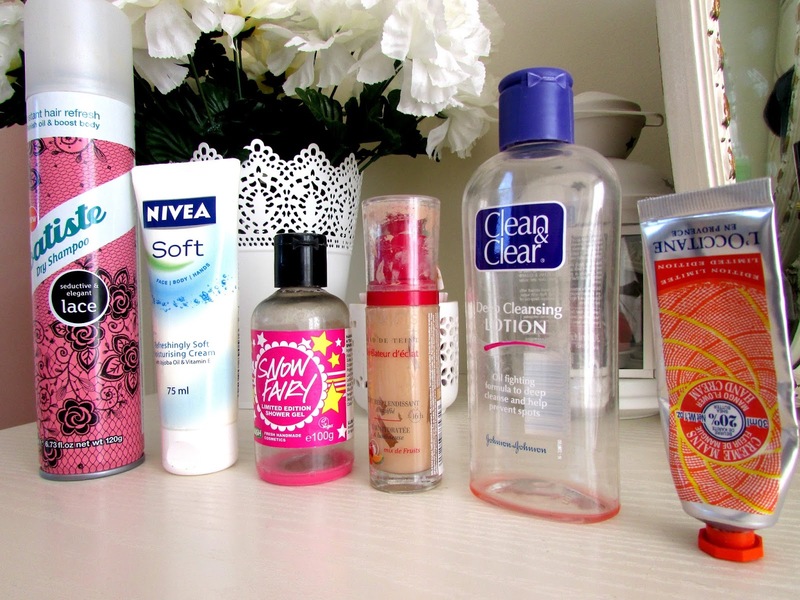 What I wear on my lips varies from day to day to be honest. I'll go in with a revlon lip butter, normally in the shade 'Berry Smoothie' or apply a tinted baby lips lip balm in the shade 'Cherry Me'. Other days I'll just not apply anything except from the baby lips lip balm in the shade 'Hydrate'. So there is my every day make up routine. 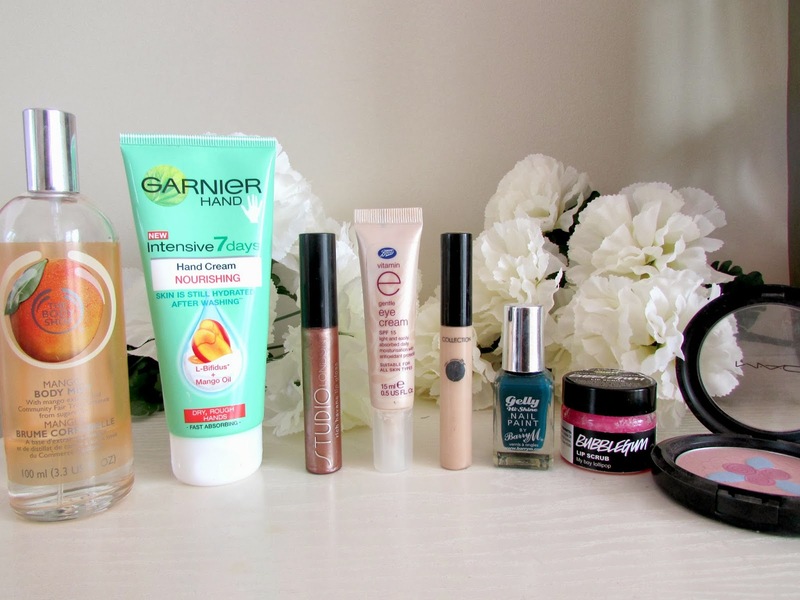 I know I don't use half as many products as some of you beauty addicts out there but if you can't already notice I prefer the more natural look and these are the products that I find suits me best and works for me. I haven't yet done a review on the Collection Lasting Perfection Concealer so if you would like a review on that product let me know. What do you wear on an every day basis? If you have a post or video then please link it below as I'd love to check it out. Hello Everyone! So over the summer BB creams were in use a lot to replace foundation. Purely because it was way to hot to wear full on make up in almost 90 degree weather. Yes you saw that right, the UK actually did have a summer. It was absolutely scorching and pretty much unbearable at times! Amazing. But anyway enough about the weather. 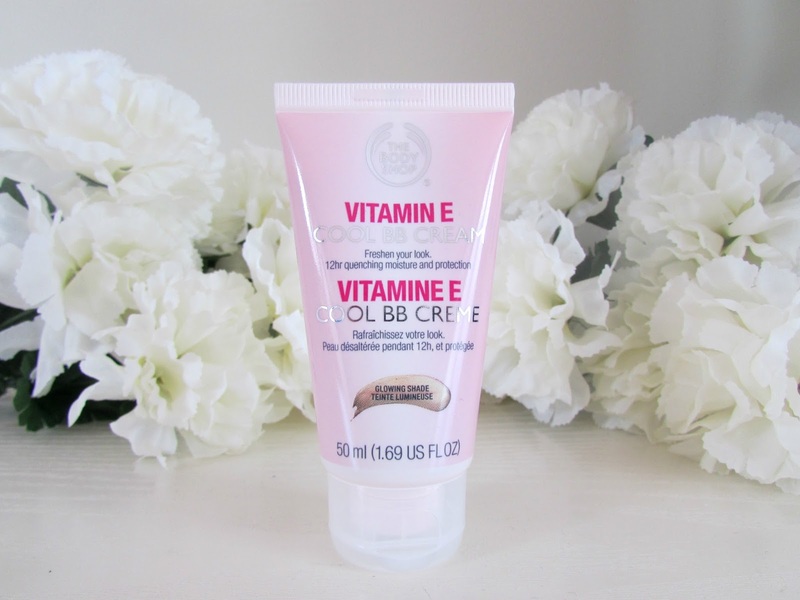 Today I thought I would talk to you about this little beauty that has been sitting in my make up collection in recent weeks and that is the Vitamin E Cool BB Cream. 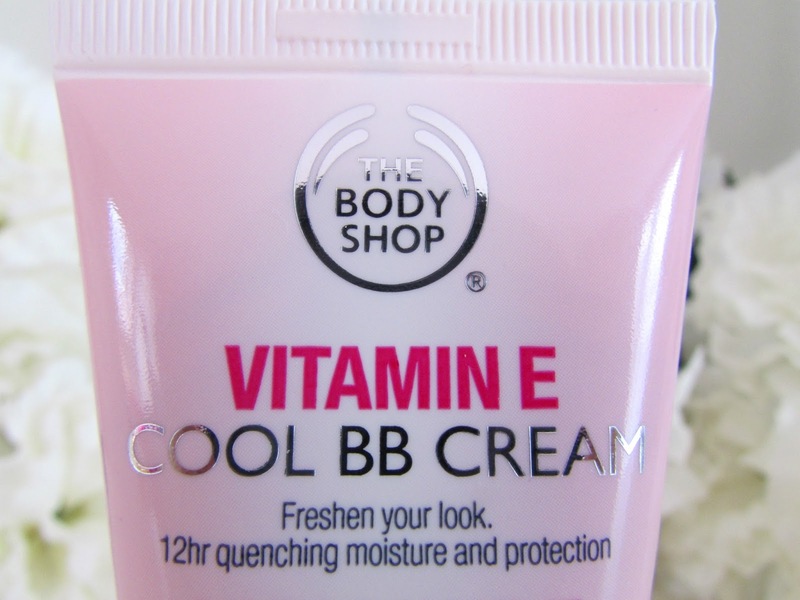 I am actually very late on the BB cream hype which is no surprise as I am always 10 steps behind everyone else. If you are late like me 'BB' actually stands for Beauty or Blemish Balm. I find they are a mixture of a primer, moisturiser and foundation all in one. So I can definitely understand the hype that surrounds them at the moment. One day around two months ago when I was out shopping I popped into The Body Shop and picked this up. I was a little bit worried about this product at first as it only comes in one shade which I found weird so I did my research and found out that it actually contains 8 different color pigments as well as mica minerals which makes it suitable for most skin tones. As you can see from the swatches above it actually looks like it would be too pale for me at first but it actually blends into my skin tone beautifully. 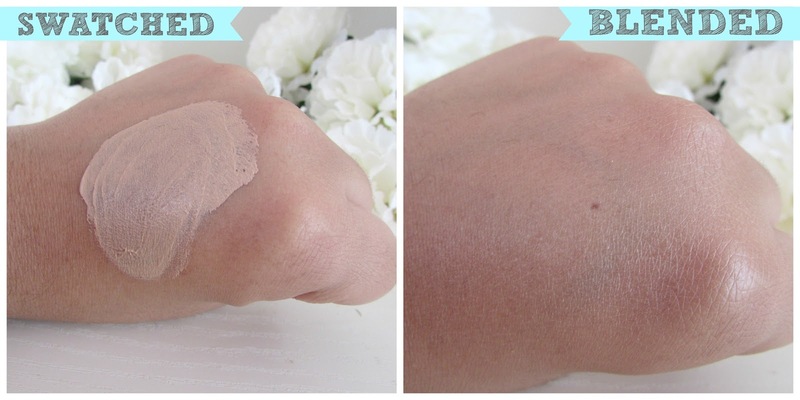 The main thing I love about this product is that it provides perfect coverage. It adds a glow to my skin and evens the color out as well. It's also not as heavy as foundations. I have found though that the 'cooling' affect of the cream is very noticeable for the first 2-3 minutes after application however after that it feels very light on the skin to the point where you barely notice you have anything on your face. As if the coverage wasn't enough this product also moisturises your skin. 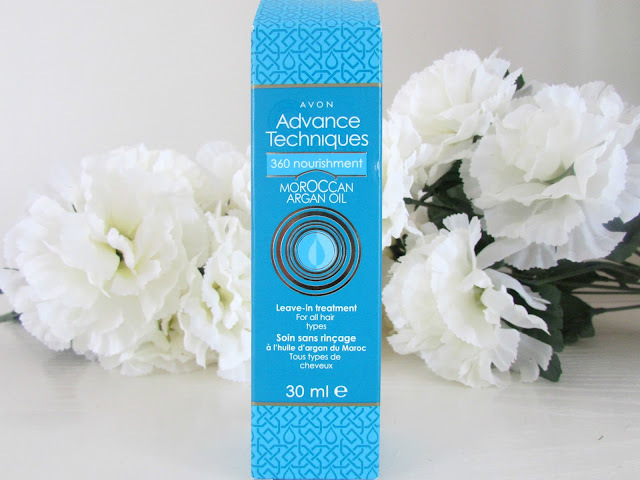 I love this as it means you don't need to apply another cream before applying this product. The Vitamin E within the product means that your skin will stay protected all day long as well. One of the benefits of having an anti-oxident product. I've actually been wearing this product a lot lately instead of foundation purely because I love the fact it feels so light. However, if you like the sound of this product it is also amazing under foundation and will provide you with more coverage if you prefer that. 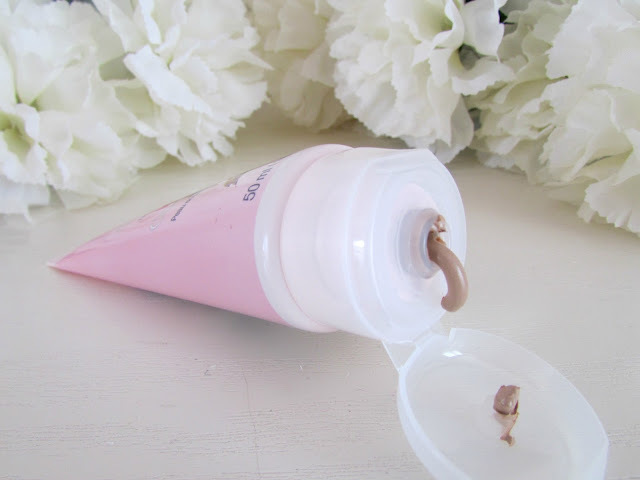 The BB cream comes in a 50ML tube and is priced at £10 which is quite pricey however I think it is worth it purely because it moisturises and protects your skin for up to twelve hours which is incredible. If you would like to check out this product click HERE. 50P from each purchase goes to Teenage Cancer Trust which is amazing so definitely pick this up next time you are in The Body Shop. Have you jumped on the BB Cream Bandwagon? Which ones are your favorite? If you have tried this BB Cream what are you views? Let me know in the comments below. Hello ladies! Hope you are all having a lovely weekend so far. The weather has changed dramatically recently hasn't it? I am extremely cold at the moment so I am snuggled up under my bed covers with a cup of hot chocolate beside me and I'm just blogging away and listening to 'The 1975' album which is absolutely amazing so check it out if you haven't already. Today however I thought I would do my first ever empties/products I've used up post!! I'm quite excited about this post. 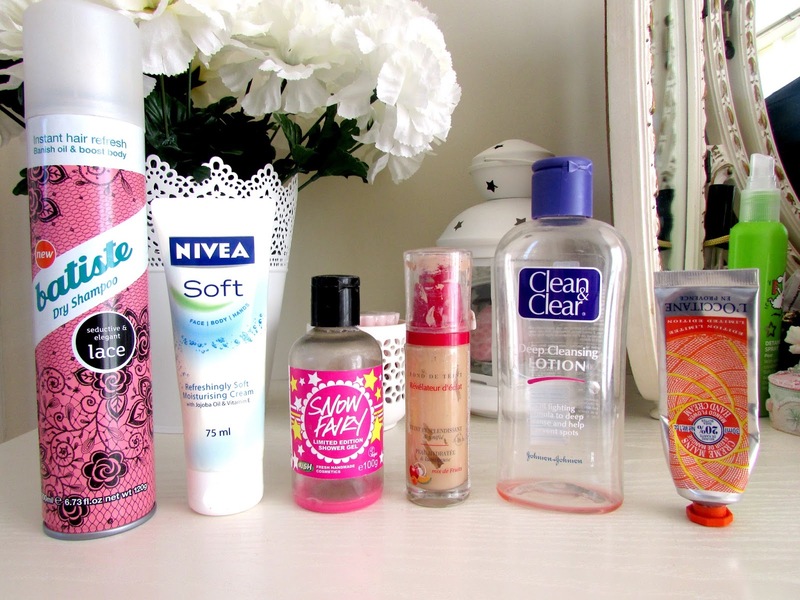 Purely because it is not really like me to use up products. Yes I know that is quite bad. I don't know why but I just can never seem to finish a whole entire bottle, tube or pot of something. When I decided to do this blog I decided, 'right that's it. 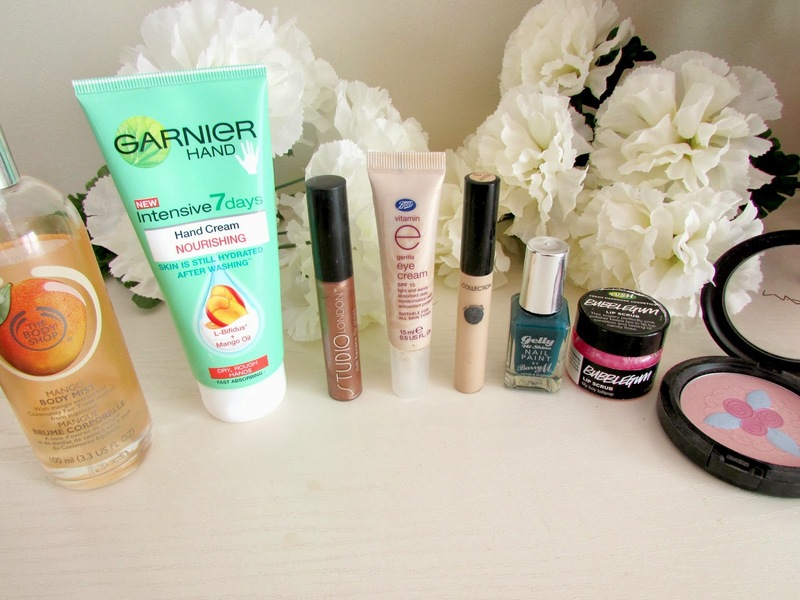 I have a blog and if people read it they will be trusting my opinions if they ever go out and buy something therefore I should use up a full product and tell them how I liked it or didn't like it' and for once I have actually stuck to my guns and recently finished all six of these products. I have amazed myself! But before I ramble on and on and on let me tell you about all of these products. Dry Shampoo wasn't actually something I ever thought of using until I was at university. There were days when I would stay in the library for ever just doing assignments and when I got home I was in the mood for a quick shower and then I'd just hop into bed. Washing my hair was definitely not on the top of my list which for me is quite unusual as I tend to take really good care it normally. I was browsing through Superdrug one day and saw this and it is absolutely incredible! It refreshes your hair between washes, leaves it smelling absolutely gorgeous and also removes all the grease and oil you have in your hair which for me is a bonus. Definitely a holy grail product! This isn't my most favorite product in the world. I don't like the packaging as it looks more like a hand cream than a body/face cream. I also don't like the texture of this cream as it doesn't feel like a cream. To me it feels more like a gel and I don't like that in moisturizers. 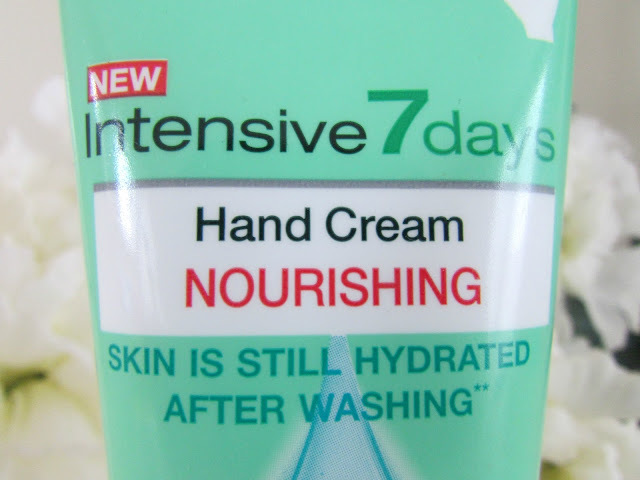 It's one of those creams that takes ages to sink in and also feels quite greasy. It also drys out my face more than it actually moisturises it. So yeah I wouldn't recommend this product at all. This shower gel was all the rage over the Christmas season but was sold out everywhere until one day before uni started after the Christmas holidays I popped into lush and saw that they were doing a special deal on the small bottles of the 'Snow Fairy'. (I can't remember what it was, but it was quite cheap). I love the smell of this shower gel, it smells a lot like Bubble Gum and lathers up really well and the scent stays on your skin as well which I absolutely love. I hope they bring it back this Christmas as I will definitely be stocking up. I recently bought the serum foundation as you are all away however I finish this foundation about a month or so ago and I absolutely loved it. It has medium coverage but is very build-able so if you prefer high coverage you would be able to achieve this. It also matches my skin tone perfectly and is not too dewy or cakey either. Amazing foundation. 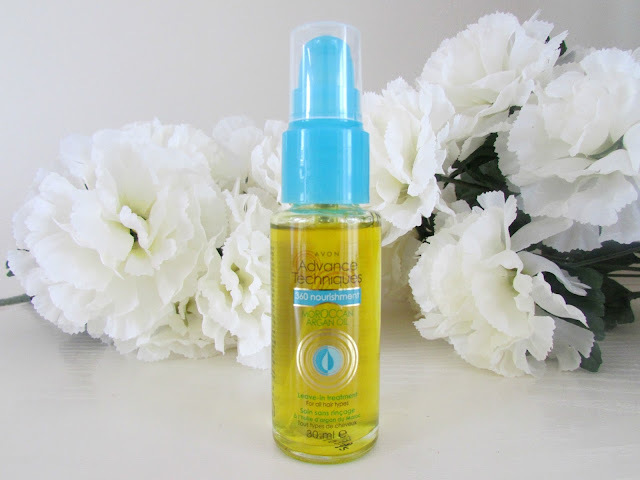 This was once a holy grail product for me and before I came across the Liz Earle Cleanser and Toner this was what I used. I love it. It removes all traces of make up from your face and leaves your skin feeling really soft and clean which is a bonus for me. 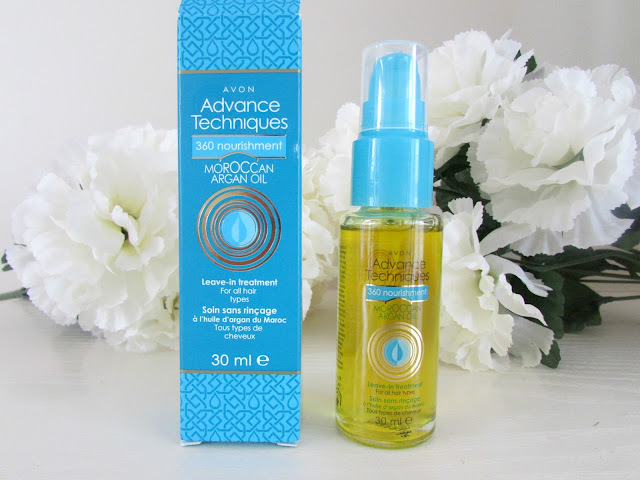 You only need to apply this to your face once to remove all the make up, I tend to apply it twice though just to make sure that everything is off my face as my skin suffers if even a trace of make up is left on there overnight! I recently finished this cream and I am actually extremely gutted as it was limited edition and I can't seem to find it anywhere online. There was a collection I wanted to get but even that has disappeared now. Not good. But anyway I absolutely love this cream. 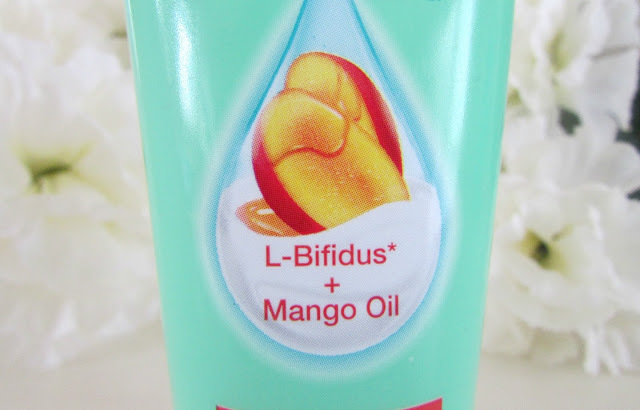 It smells absolutely gorgeous and as you all know I love me some mango scents so the scent instantly is a huge bonus but the main product is also amazing. Very moisturizing, non greasy, leaves your hands feeling super soft and makes sure that they are hydrated all day. 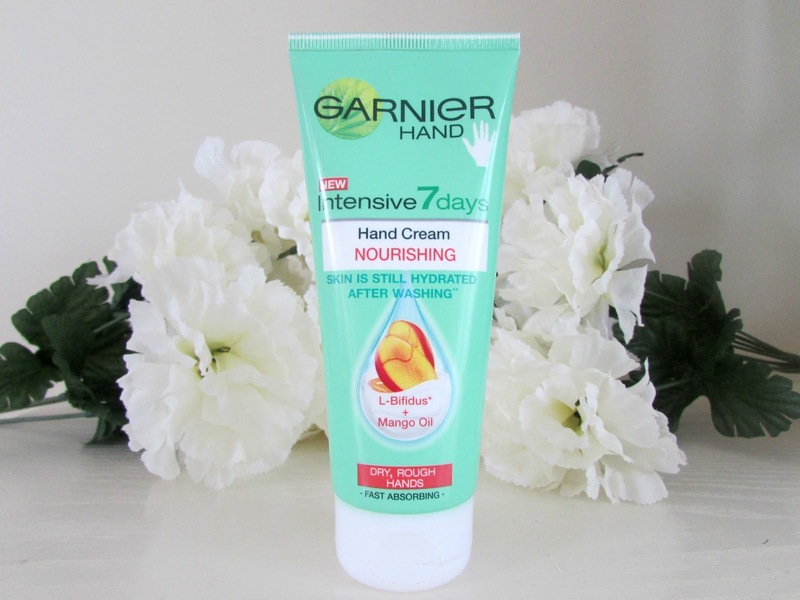 Now that the colder months are coming hand cream is going to become a must use product for me so if you have spotted this cream anywhere please leave me a comment below letting me know! I need it back in my life. If you do spot this anywhere and are interested yourself I have actually done a full review that you will find HERE so do check it out. 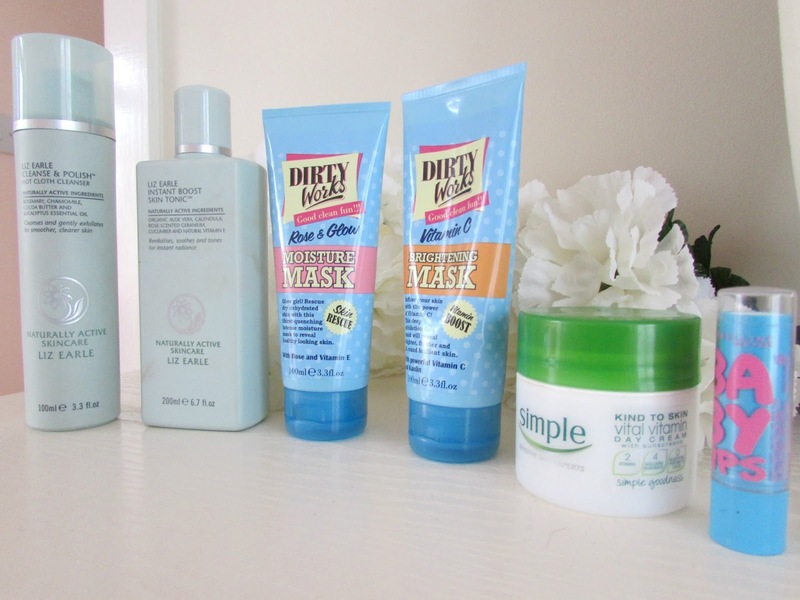 Have you used up any products recently? Are you glad you have or super gutted the product has now finished? If you have a similar blog post to this please link it below! All Pictures found on weheartit: 'The Autumn Tag' photo edited by me. Hello Everyone! So I am going to start this post with the generic blogger comment and go 'How is it September already?'. I actually cannot believe my brother is back at college and one of my little cousins has just started secondary school as well. Twitter is being spammed with students preparing for their first years of university. I can't get over how fast this year is going. But before I carry on let's get to the point of this post. I'm actually pretty happy it is September and that one of my favorite seasons is just around the corner. 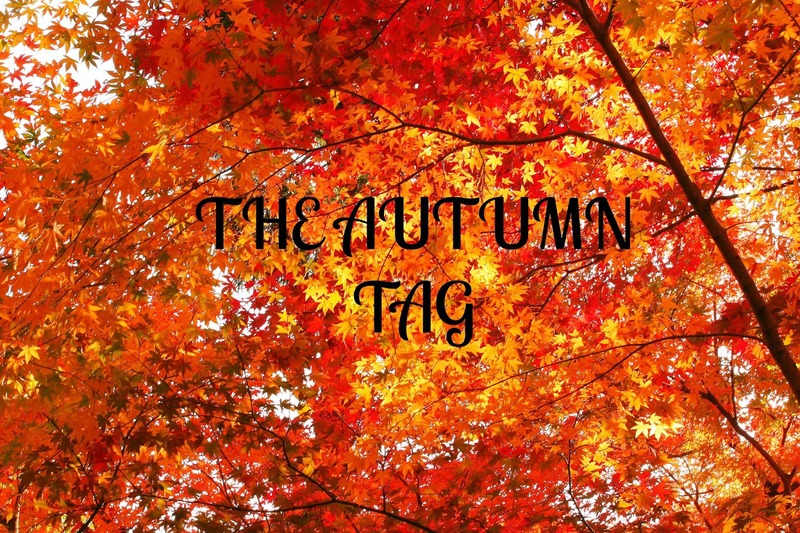 I have spotted this tag on http://www.makeup-pixi3.com/ and because I've missed doing the spring tag and the summer tag posts I thought I'd do the Autumn Tag straight away to avoid missing it. I love this season, the colors, the clothes, the drinks, the weather, everything about this month is just absolutely perfect so before anything else let's get straight to the questions for this tag. Favourite Thing About It: The clothes are definitely my favorite thing about Autumn without a doubt. I love how warm everything gets. I'm really self conscious during Summer and hate showing my arms and legs so when Autumn comes around I can get the sweaters out, the jeans finally come out and I just think the fashion in Autumn is amazing. Favourite Drink: I am a huge fan of cinnamon hot chocolate. A few years ago my mum bought a tub of it and I've been hooked on it ever since. 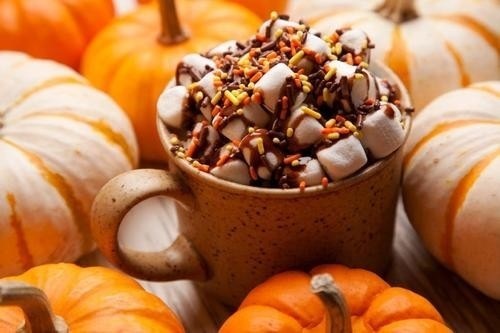 I'm not a tea or coffee person so in the Autumn Hot Chocolate is definitely my savior. Favourite Scent/Candle: I don't have a favorite candle but scent would be anything that has a strong apple cider or cinnamon scent to it. I just think that these two are the perfect ingredients for Autumn. They are both warm and spicy scents and if I ever smell anything with these two scents halloween and Autumn just come to mind immediately. Best Lipstick: Now during Autumn the weather starts to get a little bit chillier so I will probably stay away from lipstick but stick to my 'Moroccan' lip butter from Revlon. I think it is the perfect color for Autumn and will go with every outfit I wear. However my mum recent bought the Urban Decay Venom in Shimmery Berry. A slightly warmer but absolutely gorgeous color that I know I'll be using a lot. Go To Moisturizer: Any moisturizer from Nivea. 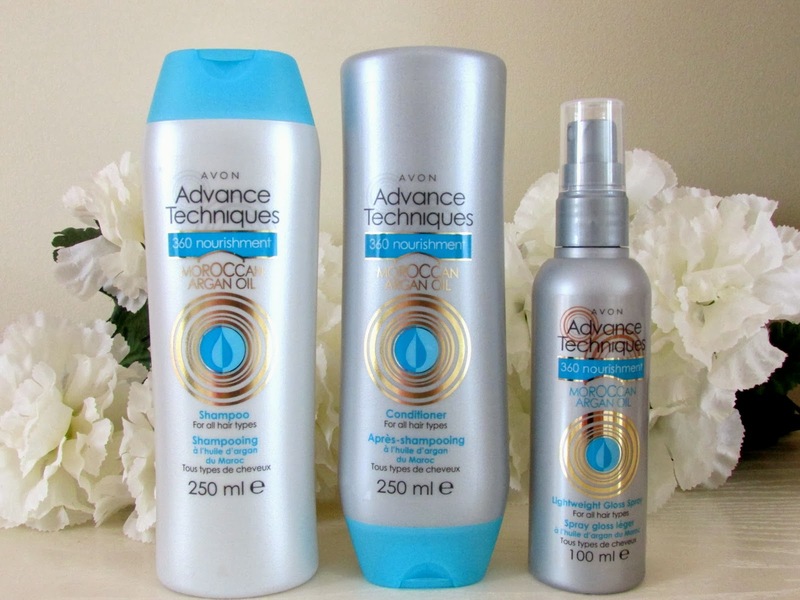 I've been using this brand for literally years thanks to my mum and I absolutely love it. 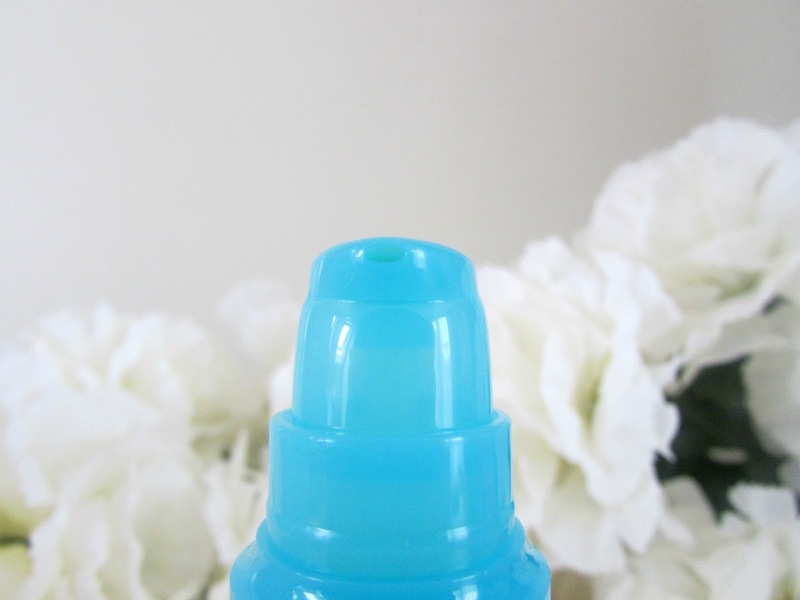 Perfect for hydrating the skin, locks in moisture and best of all isn't greasy at all. Nivea always have a moisturizer to prevent my skin from being so dry so I will definitely be using them this season. Go To Colors For The Eyes: Definitely burgundy red. My friend, Gabriella aka Velvetgh0st on youtube done a gorgeous burgundy tutorial that I will definitely be trying out over the Autumn Season as I couldn't think better colors for it. If you would like to check out her video then click HERE. Make sure to subscribe as well as she has got a lot of amazing videos coming up for the Autumn season, particularly around Halloween. You don't want to miss it. Favourite Band/Artist To Listen To: The 1975. I discovered this band a few months ago and absolutely love them. They have an incredible sound and recently released their album that it absolutely incredible and one I will definitely be having on repeat for the rest of the month. Favourite outfit to wear: This is easy. A big chunky oversized sweater, jeans, and ankle boots and a long necklace. As you can see from the weather at the moment it is pretty warm so I won't be wacking out the uggs until it gets a lot colder. I don't really dress according to season but in Autumn and even winter this is my favorite look to rock. Autumn Treat (i.e what will you treat yourself too): This is a tough one as I am currently unemployed and therefore will not be treating myself that much unless I get a job. I reckon I will be treating myself to some new jumpers or accessories. Possibly a few burgundy scarfs this year. Burgundy is definitely going to be a color I'll be checking out a lot this Autumn as I love it so much. Favourite Place To Be: At home in my room or in the living room curled up on the sofa with a good book, a mug of cinnamon hot chocolate and the 1975 playing on my iPod. Of course I'll be replacing a book with my blog as well. 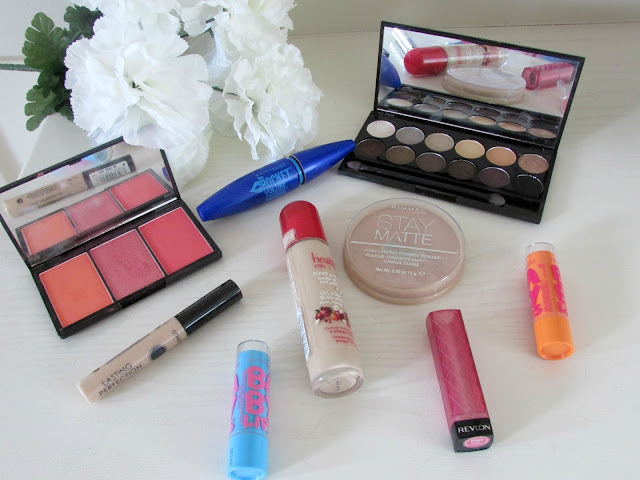 If you do this tag make sure to tweet makeup-pix3 aka TwinklinPix3 who is the creator of this tag your blog links. What is your favorite thing about Autumn? 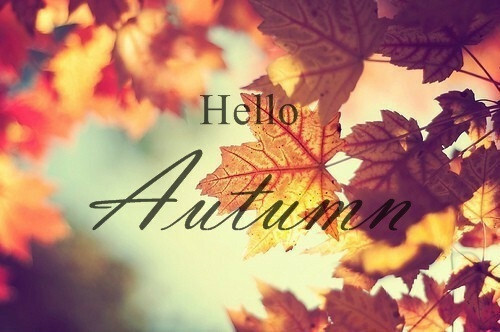 Are you excited for the colder months or dreading it? Leave me a comment below!